Pure Digital has taken the videomaking world by storm in America, with its easy to use Flip Video. Cashing in on YouTube, the cam had an instant upload facility to the video site and was the perfect point-and-shoot machine. With the Flip Video landing in the UK earlier this month, we too can now try out the Flip to see what all the fuss is about. Not to be outdone, though, it seems that another model is already ready for release in the US. Called the Flip Video Mino – as in minnow and not wino – the diminutive camcorder houses some 2GB flash memory – equivalant to 60 minutes' video – a 1.5in LCD screen and a flip out USB connector, so you can plug it straight to your computer for uploading. You also get a TV-out connection if you want to show off your footage before it's been edited. Don't expect to do any fancy camerawork with it, though, as all you get is a basic set of controls and a 2x digital zoom. The Flip Mino is said to be the size of an average mobile phone, and its looks reflect this. You can get one now in the US for $180 (£90). 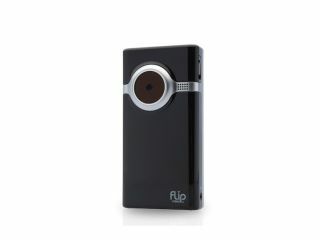 There's no word on a UK launch, but don't expect it any time soon, as we've only just managed to get hold of its bigger brother, the Flip Video.